Explanation: Every book has a first page and every catalog a first entry. And so this lovely blue cosmic cloud begins the van den Bergh Catalog (vdB) of stars surrounded by reflection nebulae. 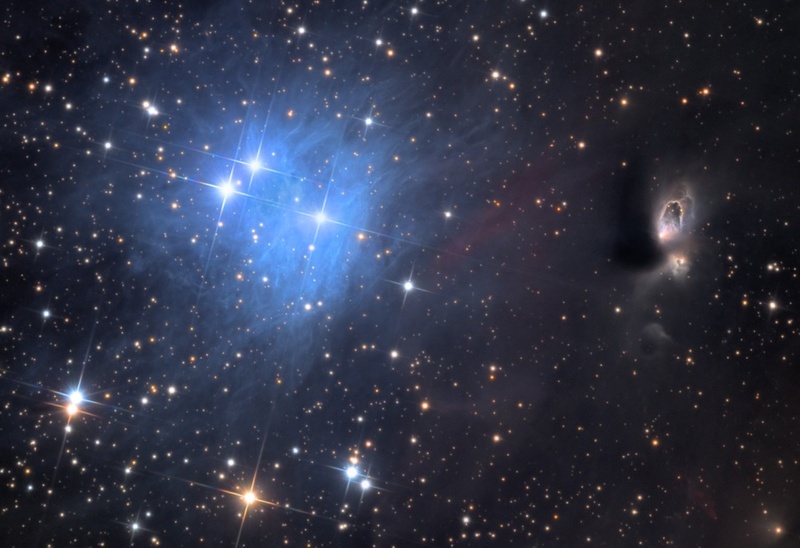 Interstellar dust clouds reflecting the light of the nearby stars, the nebulae usually appear blue because scattering by the dust grains is more effective at shorter (bluer) wavelengths. The same type of scattering gives planet Earth its blue daytime skies. Van den Bergh's 1966 list contains a total of 158 entries more easily visible from the northern hemisphere, including bright Pleiades cluster stars and other popular targets for astroimagers. Less than 5 light-years across, VdB1 lies about 1,600 light-years distant in the constellation Cassiopeia. Also on this scene, two intriguing nebulae at the right show loops and outflow features associated with the energetic process of star formation. Within are extremely young variable stars V633 Cas (top) and V376 Cas. 2pm EDT Saturday until 3pm EDT Sunday. A list of alternative mirror sites can be found here.